Good morning and Happy Halloween to one and all! 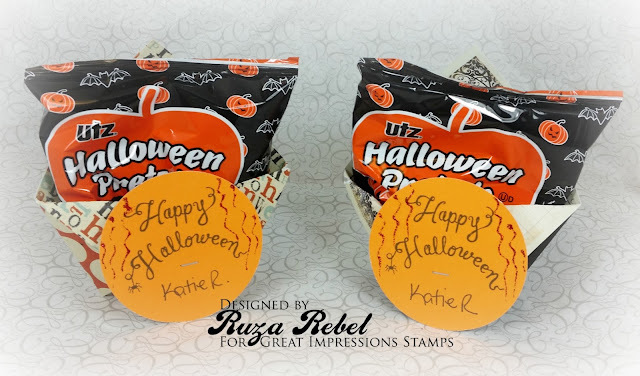 Ruza here to share a cute way to hand out Halloween Treats featuring the Happy Halloween Sentiment (E811) from Great Impressions Stamps. I saw a video on Facebook not long ago showing how to make these quick and easy origami treat holders. 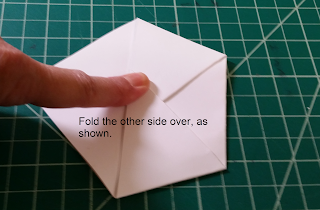 Unfortunately, I don't have a link for you but I will share how I made them. 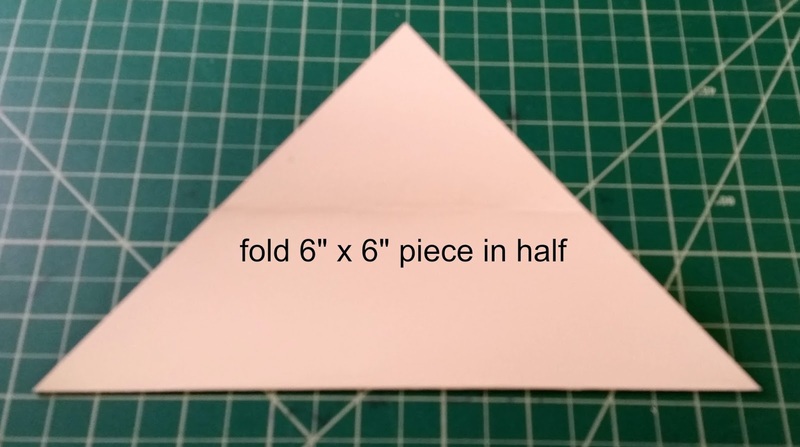 Take a 6x6 sheet of paper and folder it in half like a triangle. 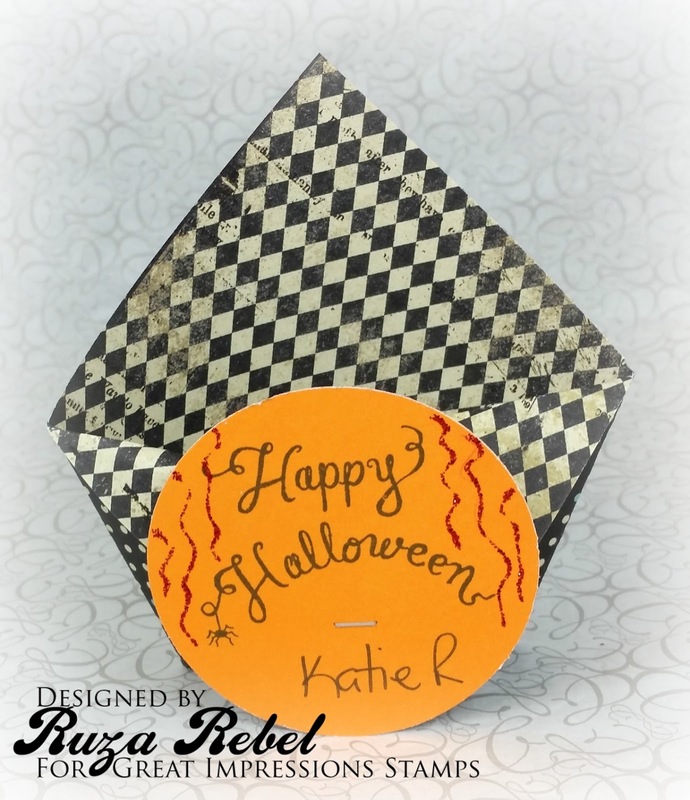 I made 24 of these using a 6x6 pad of Halloween Design Paper. Once all of the treat holders were made I then stamped the Happy Halloween Sentiment on 24 circles, wrote my daughter's name on them, then added some Red Stickles dripping down the sides to represent blood. Once they were all dry I attached each circle to a treat holder with my Tim Holtz Tiny Stapler, and stuffed them with a treat. Here is what they look like filled up. Now I only took a picture of 2 of them side by side. The October Great Impressions Challenge ends tonight. However, our November Challenge goes lives on Sunday, November 6th. Greeting, fellow stamp lovers! 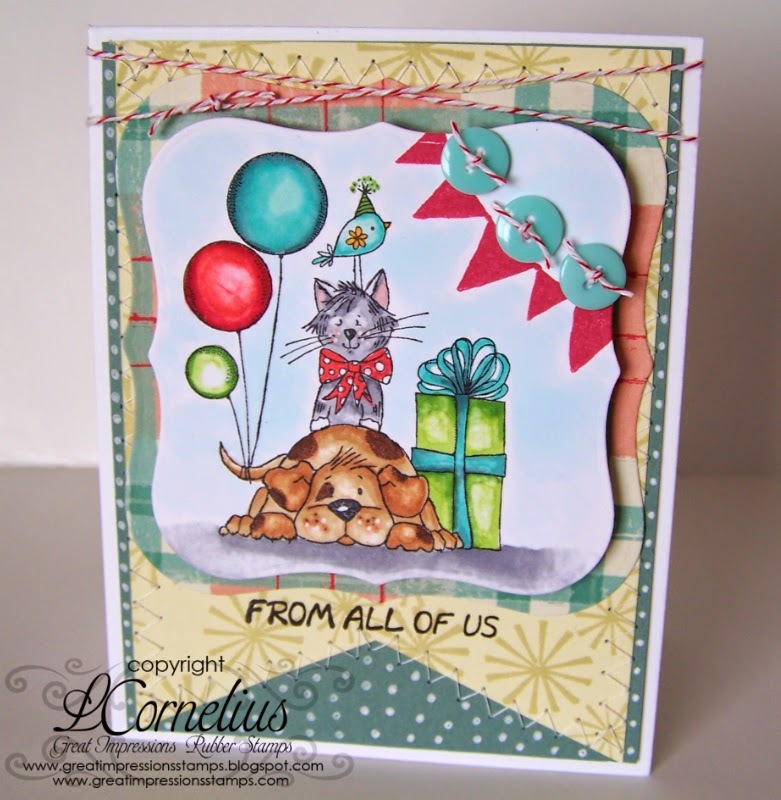 Julie here today from Muddy Paws & Inky Fingers with a recap of a Christmas card I made a few months ago. 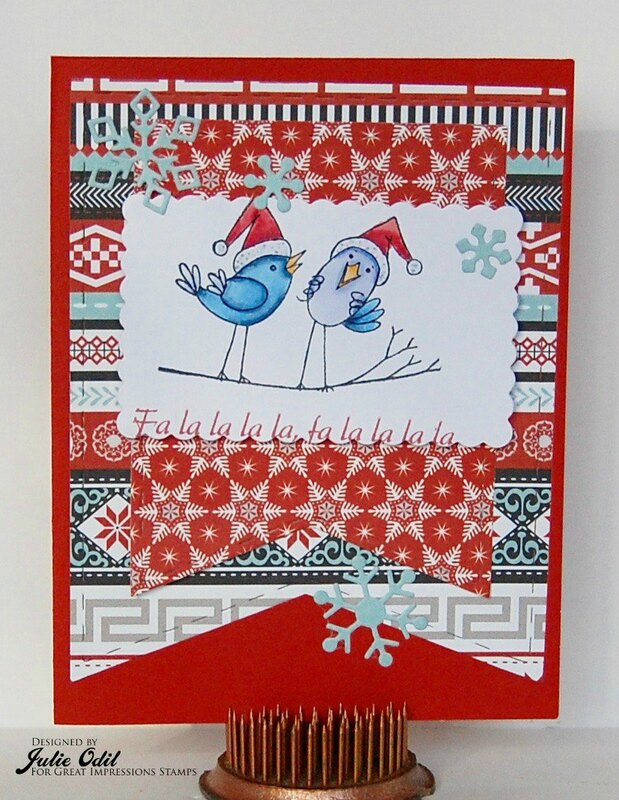 This card features E815 Singing Birds and D472 Fa la la la la. I colored E815 Singing Birds with Copic markers. I added a bit of Icicle Stickles glitter glue to their hats for some added sparkle. Check out all the wonderful Christmas stamps in the Great Impressions Store. You won't be disappointed! Hello! 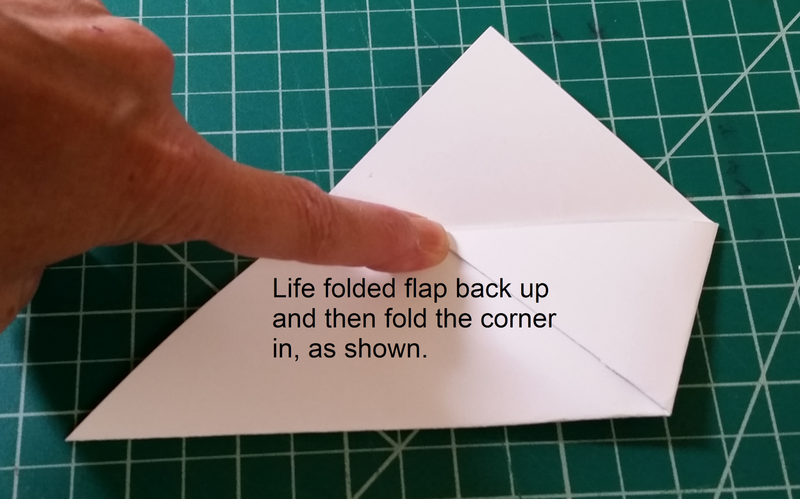 Leah here.Today I have a flashback birthday card for you! Isn't this image adorable? The image is called Birthday Friends (G505). I had the most fun coloring this sweet image. I used Copics to color and then added the Flag Banner (E846) to the side of my image panel. The fish tail banner was stamped using the Twirly Background Sm. image (E845) and the sentiment is From All of Us (B154). I added some machine stitching and buttons with twine. Come and join our monthly challenge! If you use a stamp from the Great Impressions online store, please link it up in our Customer Gallery, too! Good morning! 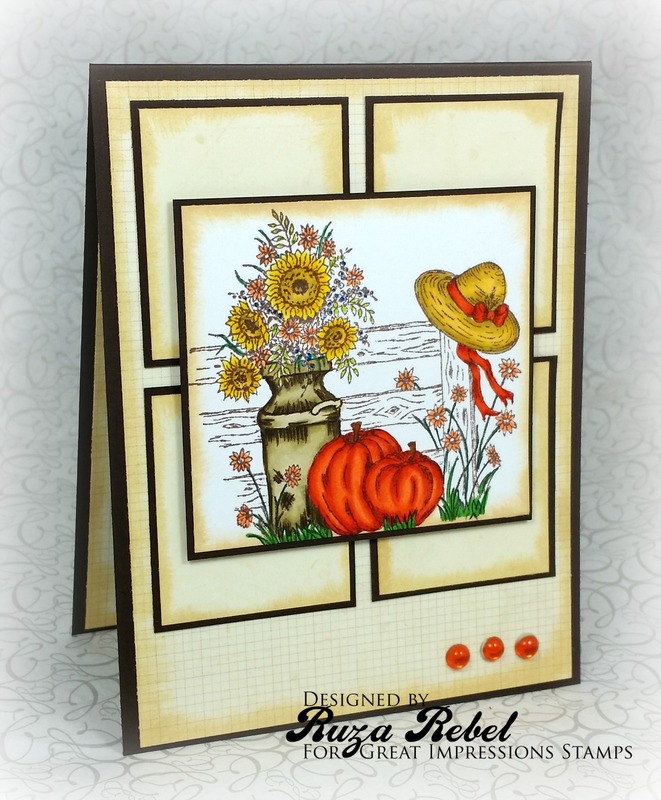 Ruza here to share a Fall card featuring the lovely Vintage Milk Box (F530) and Hello Friend Sentiment (B152) from Great Impressions Stamps. Using Ranger Coffee Archival Ink I stamped the Vintage Milk Box on watercolor paper. I applied Marvy LePlumme Markers to my palette and used my brush with water to color the image. I created a little shelf under the milk box, cut the image out with my circle die, added Vintage Photo Distress Ink around the edges, and then distressed the edges with my tool from Tim Holtz. I cut out a couple of stitched rectangle dies, inked the edges and layered them on my inked cardbase. 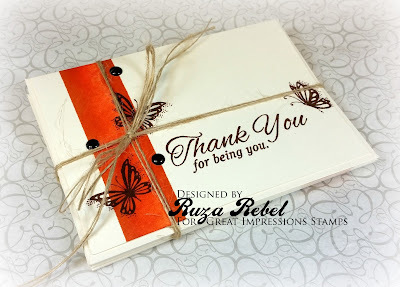 After lining up where I would put the milk box, I stamped the Hello Friend Sentiment with Memento Cocoa Ink. Using 3D Foam Tape I added the milk box. The final step was to add yellow enamel dots to the flowers. The October Great Impressions Challenge is live so make sure you stop by for all of the details, and if you use some Great Impressions Stamps make sure you link them up in our Customer Gallery! Good morning all. We are taking another look at all of the beautiful Fall projects that our Guest Designer Dori Shelton shared with us during the month. First up is the gorgeous card that Dori made for our October Challenge. I really love how she combined the colors perfectly along with the monochromatic design. 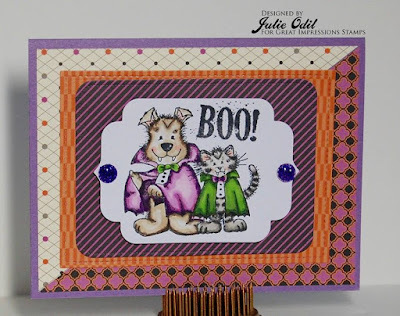 Next, Dori created such an adorable Fall card! She did a great job coloring those adorable kitties and finished it with a sweet design. 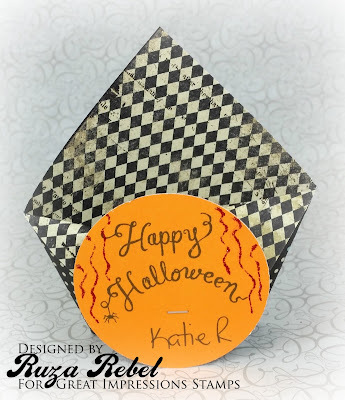 Dori's final project is a Spooktacular Halloween card. 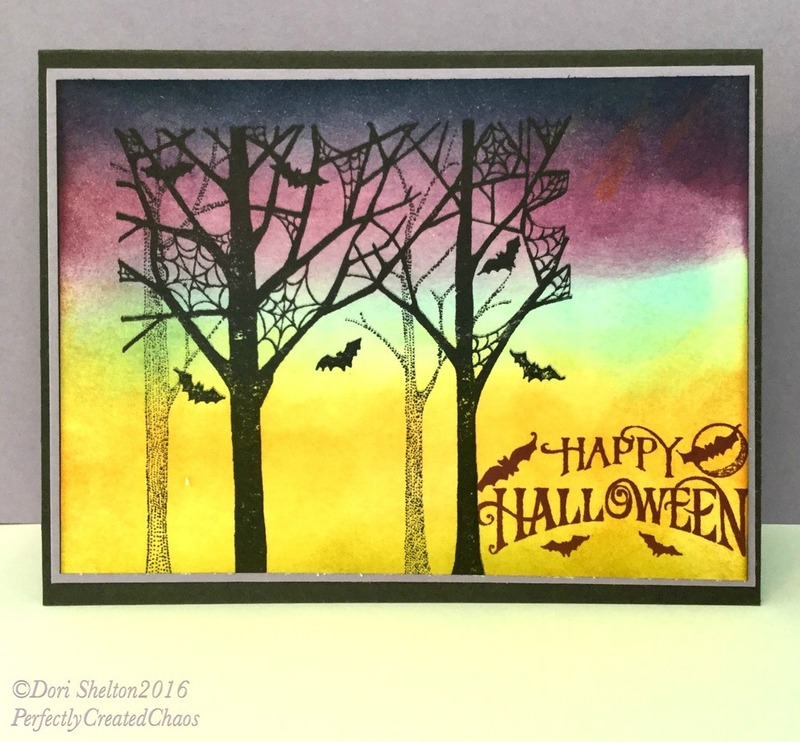 The way she used her distress inks to created the night scene is amazing! It has been a pleasure having Dori share these awesome projects with us. 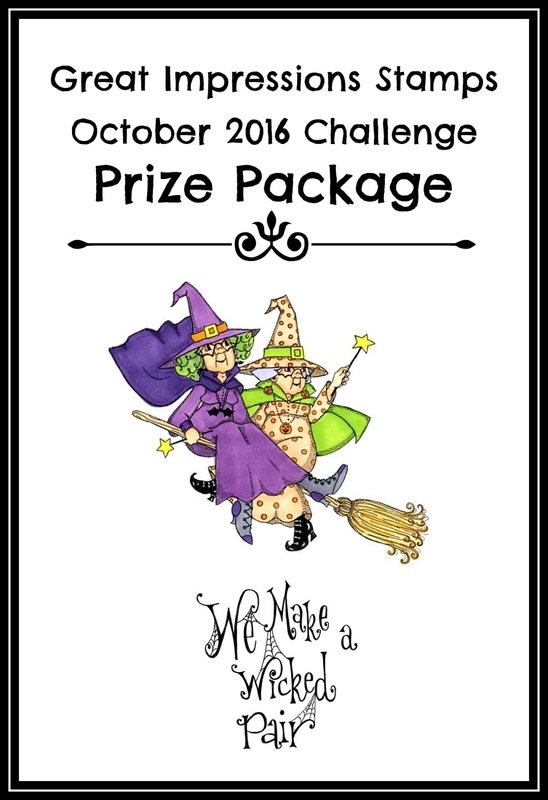 You still have time to join in our Great Impressions October Challenge! Make you stop by for all of the details, and if you use some Great Impressions Stamps make sure you link them up in our Customer Gallery! I colored F591 Harry & Sunflower with Copic markers. The sentiment is B152 Hello Friend (another favorite of mine). 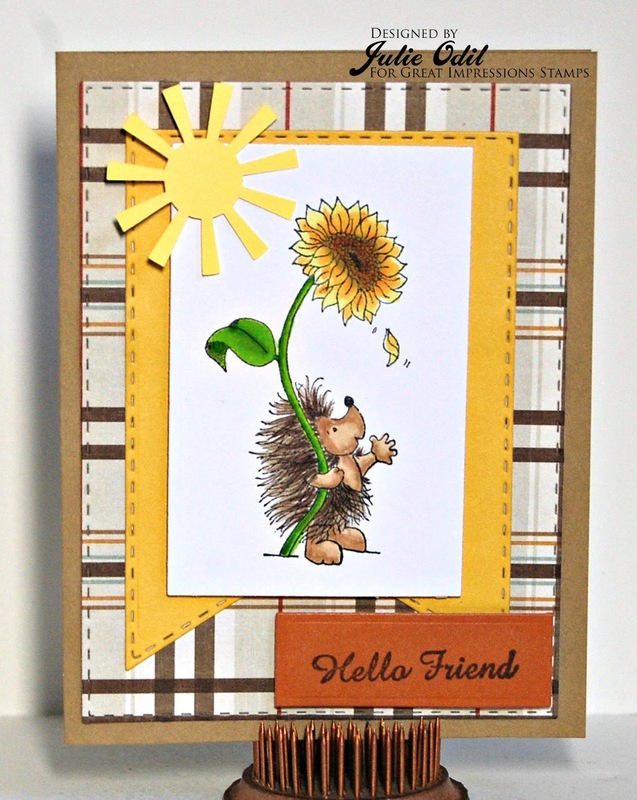 Have you joined in with the Great Impressions Stamps monthly challenge yet? It's anything goes, and it goes all month, so there's still time! Don't forget to check out all the awesome Harry characters in the Great Impressions online store -- and the other wonderful rubber stamps! Hi! Leah from Paper Blossoms here. I am always sad to see the warm weather go but my garden is still pretty with a few flowers in bloom. 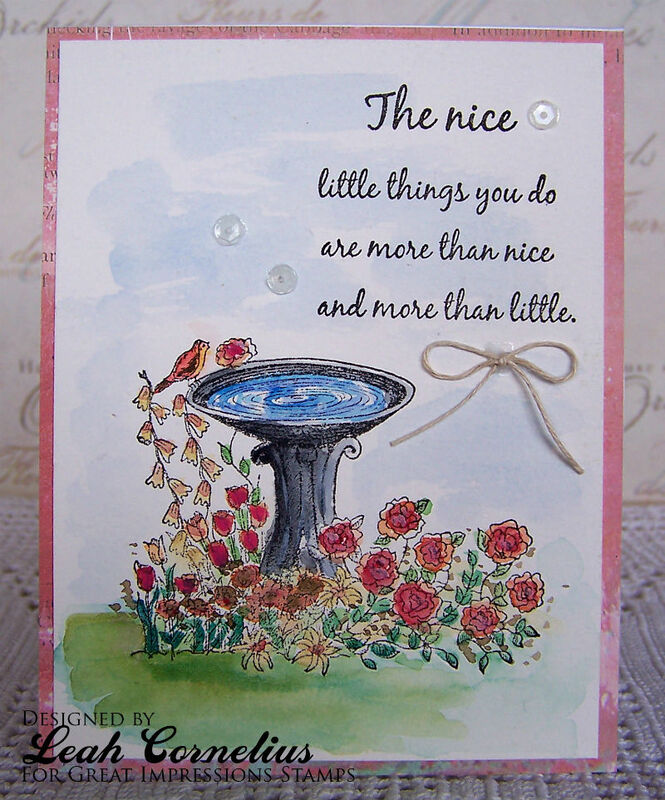 I have a little bird bath in my garden as well so I really liked this stamp. The image is called (H19) Bird Bath. The sweet sentiment is called (E900) More Than Nice. I stamped the image in Versafine Onyx Black ink and watercolored it. I went with fall colors. A twine bow and a few sequins finish is off. Good morning! Ruza here to share a Fall card featuring the lovely Fall Garden (H23) from Great Impressions Stamps. I stamped the lovely Fall Garden with Memento Rich Cocoa and color the image with my Copic Markers, leaving the fence uncolored. Antique Linen Distress Ink was applied around the edges of the cut-out image, and the cream colored DP I used. Each section was layered onto Cocoa cardstock and layered together. The final step was to add the three bling along the bottom of the card. Clean and Simple with layers. Good morning all. Our Guest Designer Dori Shelton is joining us today with a Halloween card. For the background of Dori's card, she used a variety of distress inks to create the blended night background. Dori stamped Batty Trees (K103) over the background in black ink and then stamped the Halloween Sentiment (C486) in Seedless Preserves in the corner. She did a awesome job! I really love that background she created. Make sure you stop by Dori's Blog for more details on how she created today's card, and don't forget to leave her some love. One more thing to share with you today. 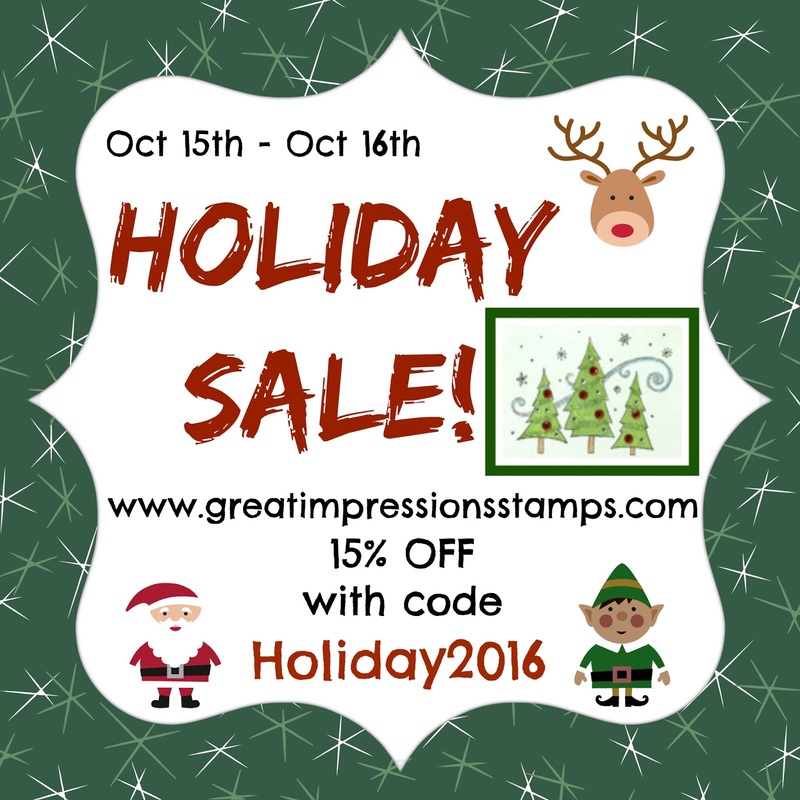 The Holidays are fast approaching and it's the perfect time for a HOLIDAY SALE over at the Great Impressions Store! 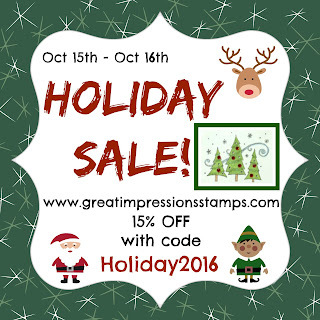 So get out your Wish List of stamps that you have been wanting and take advantage of the 15% Sale using Sales Code, listed below, during check-out. Make sure you check out the NEW HOLIDAY STAMPS while you are there. The Great Impressions October Challenge is live! Make you stop by for all of the details, and if you use some Great Impressions Stamps make sure you link them up in our Customer Gallery! Hello, fellow stamp lovers! 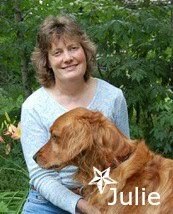 Julie here today. Are you ready for Halloween? I have a super cute Halloween card to share with you. I like Halloween to be cute, not spooky, so these 2 rubber stamps from Great Impressions Stamps were perfect for this card. I used F617 Caped Buddies and A135 Boo! on this card. After stamping F617 Caped Buddies onto white card stock, I colored the image with Copic markers, then stamped A135 Boo! onto some white space near the colored image. I'm trying to get enough Halloween cards made for all the residents in my nursing home. Add another to the pile! 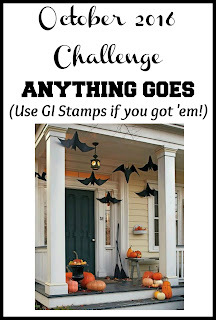 Great Impressions Stamps has a monthly challenge going on that goes all month. It's Anything Goes. Come join us! Check out the many awesome stamps in the Great Impressions Online Store. You'll find free shipping on orders over $25! 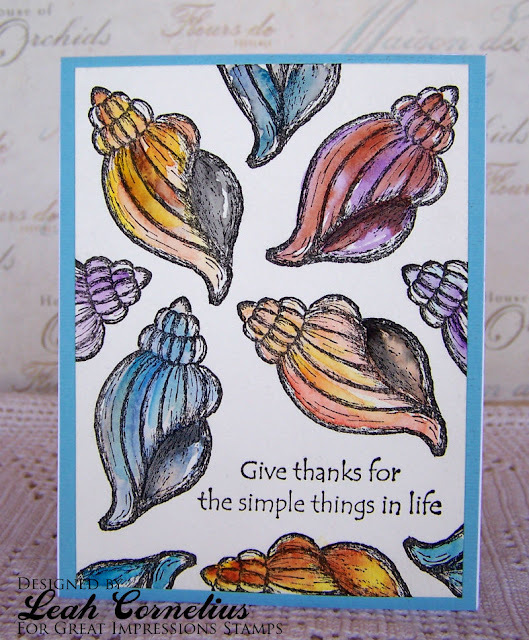 For my card I wanted to use this pretty shell stamp and watercolor them. The image is called (E587) Sea Shell. I stamped it repeatedly onto watercolor paper and used Gansai Tambi watercolors to color them. The sentiment is called (D374) Simple Things. Good morning! 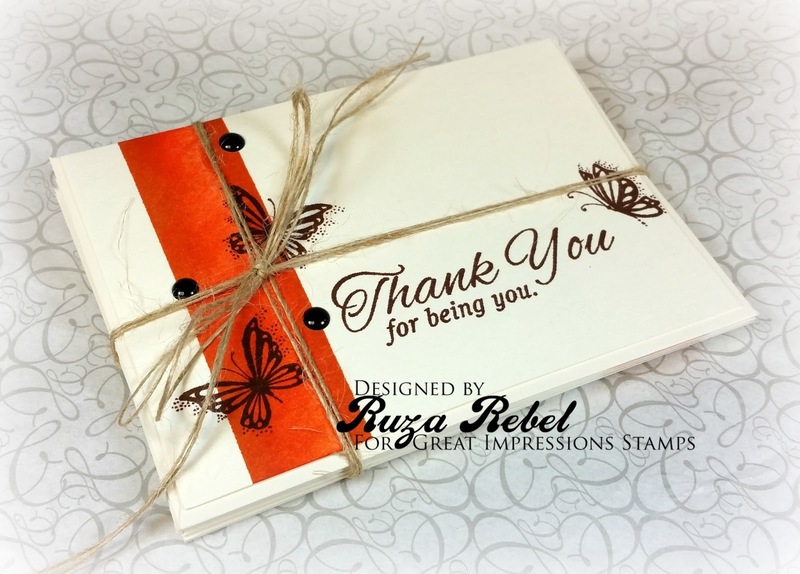 Ruza here to share a set of A-1 Thank You cards I created featuring Great Impressions Stamps. I'm participating at a Craft Fair this weekend at a local school, and here is one of the projects I created for the sale. I pulled out my much loved Elegant Butterflies (J119) along with the Being You Sentiment (D509). Using various inks I created a 1/2-inch panel on the left side of each card and envelope. I then used my Misti to stamp the butterflies and sentiment on each card, and I also added a butterfly to each of the envelopes. Using the Misti allowed my stamping to be identical on all of my cards. Love this piece of equipment. 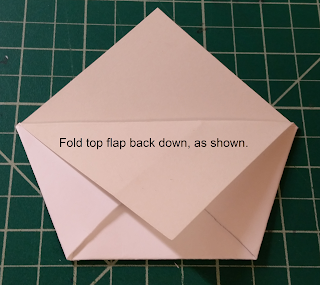 I've used this technique in the Fall last year on a full size card and I really love the design/layout. Once done with all my stamping I added some enamel dots, and tied the bundle of cards up with some twine. We all need extra Thank You cards in our stash, and I know that the parents attending this weekends event will be looking for some. I went with Fall colors for my panel, but you can use any seasonal colors with this design. 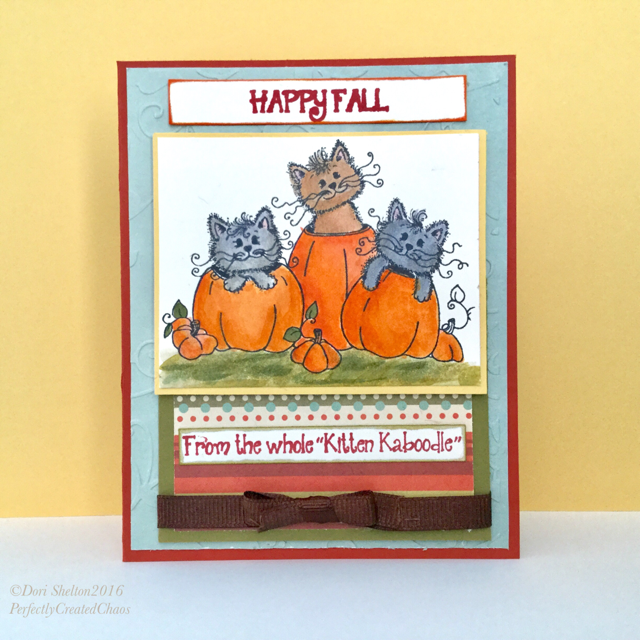 Dori used Kitties in Pumpkins (H272) along with the Fall Kaboodle Sentiment (D510) for today's card. 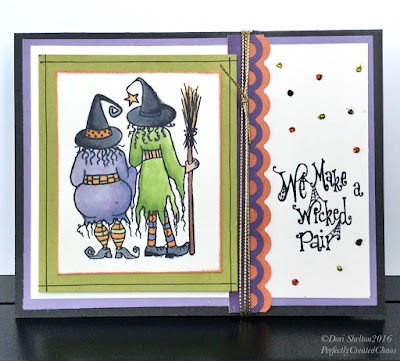 She stamped the image with Ranger Archival Black Ink and used a variety of Copic Markers to color it in. She then stamped the sentiment and separated it, in order to make it work better with her design. She did a awesome job! Make sure you stop by Dori's Blog for more details on how she created today's card, and don't forget to leave her some love. Hello, and happy Friday! Julie here today with a fun Christmas card. This week, Great Impressions Stamps is sponsoring the MOD Squad challenge blog, where the theme is "For the Birds". I love flamingos. How can a bird be so pink and still survive in the wild? I think they are just awesome! But, flamingos in Santa hats? Well, that is simply delightful! This card uses 2 rubber stamps from Great Impressions Stamps -- G446 Holiday Flamingos and C426 Simply Delightful. 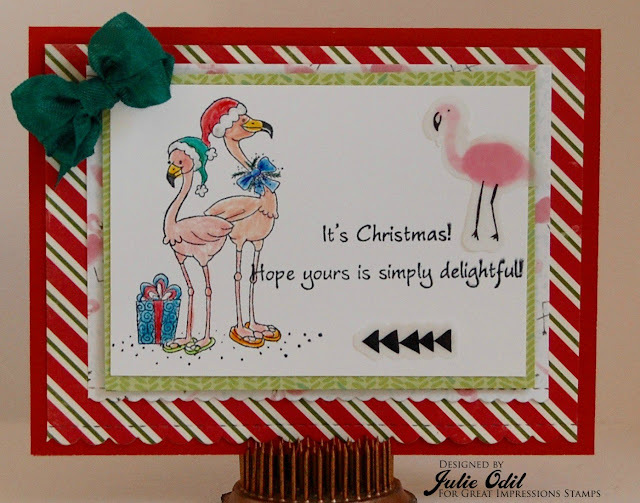 I colored G446 Holiday Flamingos with color pencils, then stamped the C426 Simply Delightful sentiment directly onto the colored image. 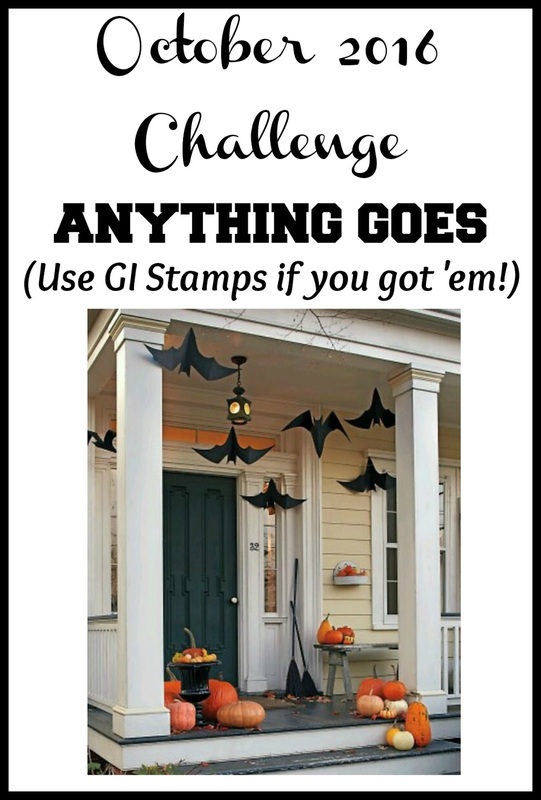 Great Impressions Stamps has a monthly challenge going on that just started. It's Anything Goes. Come join us! Hello! 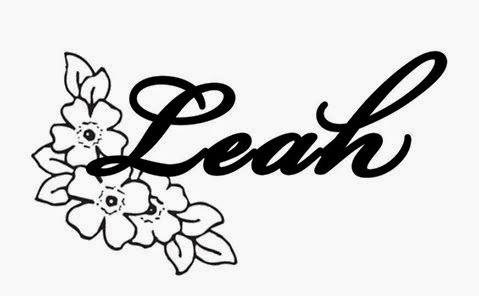 Leah from Paper Blossoms with you today. This week Great Impressions is sponsoring the Mod Squad challenge. The theme is "for the birds." 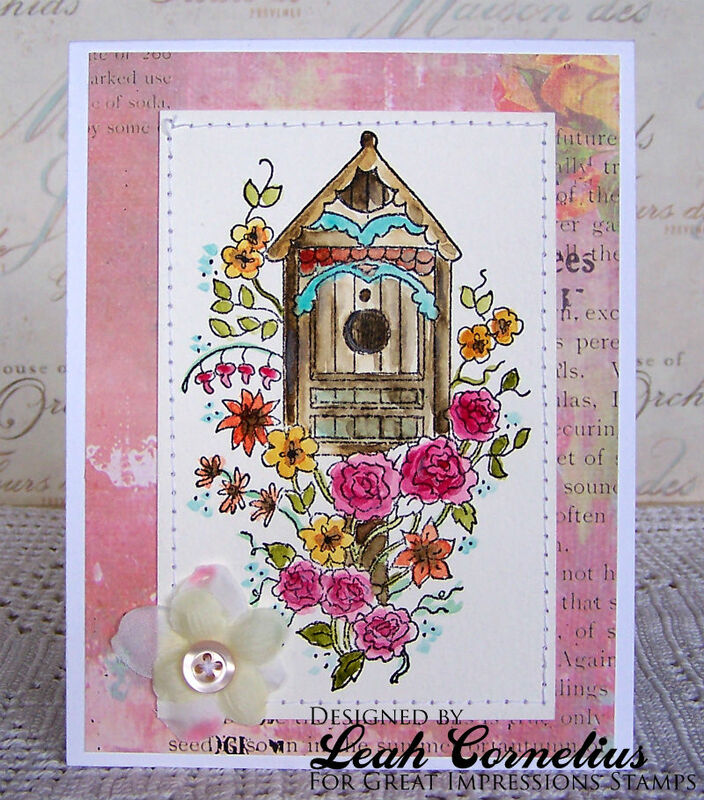 So I pulled out this gorgeous stamp called (K12) Floral Bird House. I stamped the image in Versafine Onyx Black ink and watercolored it. I added some patterned paper, stitching and a hydrangea flower with a sewn on button. Good morning! 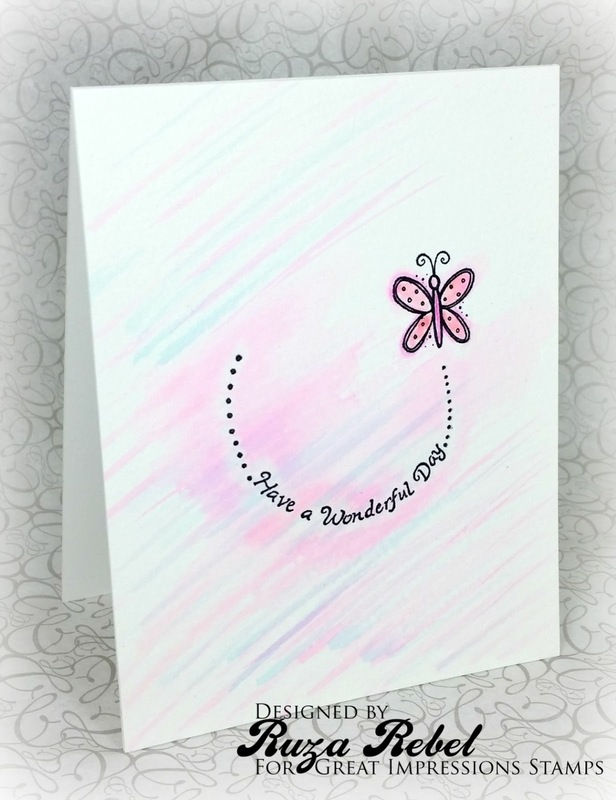 Ruza here to share a card I created for Breast Cancer Awareness featuring Great Impressions Stamps. I recently ordered the Have a Wonderful Day Sentiment (F231). I love the sentiment with the butterfly. October is Breast Cancer Awareness Month, and this stamp is a perfect match. 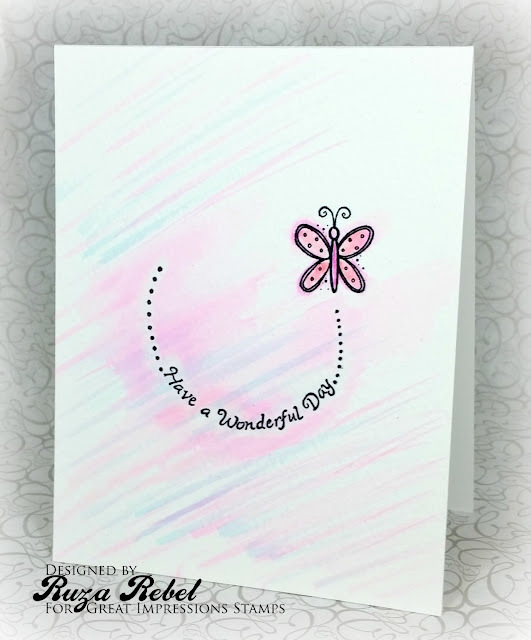 I stamped the sentiment with Ranger Jet Black Archival Ink on Strathmore Cold Press Watercolor Paper, and went to work watercoloring the image and background with my Marvy Markers ... #57 Rose Pink, #20 Magenta, and a bit of #75 Sky Blue. I really love how the image pops against the soft colors. Good morning and welcome to another monthly Challenge here at Great Impressions! Before we get started, we have some Winners to Announce! Now for our "Top Picks"
All of you have made a GREAT IMPRESSION on us! It's time to move on to our New Challenge. Let's give a BIG Welcome to our Guest Designer Dori Shelton. Dori will be sharing her creations during the Month of October will all of us. 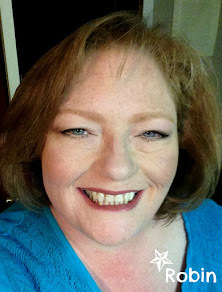 My name is Dori and began scrapbooking in 2003 while living in Okinawa during my husband’s deployment to Iraq. I was pregnant with my second child, and it was just a great way for me to keep my mind off of many things that were stressing me out at the time! 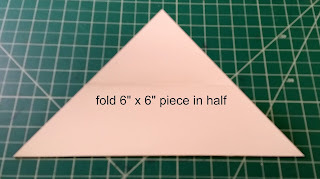 Gradually, I got more into card making and started my blog to share that creativity with others in hopes to inspire and teach others as well. 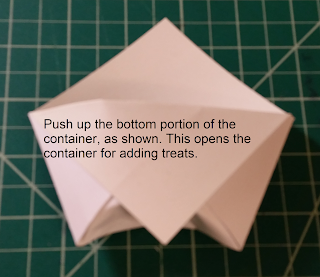 I’ve also learned so much from the paper crafting community over the years. We are still a military family, we still move…all the time…and I still pack up all my craft stuff and unpack it every 2-3 years! Our 2 children in Okinawa turned into 3 children and now they are all a little older (16, 12 and 10) leaving me more time to craft which is great! But at the same time, I’m still a “school taxi, homework helping/suffering, laundry doing, lunch packing and baseball mom” So in other words, I can’t really remember the last time I was bored! I do still scrapbook; but I do that on a personal basis when I have time. I don’t blog or share them online, however. I love my paper crafting hobby. It keeps me sane, it keeps my mind focused and it’s just for me. I love designing an idea in my head, sketching it out, and then pulling the materials from the shelves and then putting it all together! 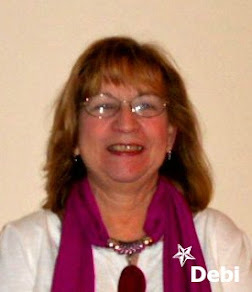 Now let's see what Dori created to inspire you! Dori did an amazing job coloring these lovely ladies with her Copic Markers! Such a lovely layout also. Make sure you head over to her blog and leave her some love. Our Designer's would love to hear what you think of their projects. Hop on over to their blogs to leave them a little love! If you don't have a blog, you may post your entry in the gallery at Splitcoaststampers using the keyword GISMC in the Title, and then link it up below so we can find your project. This way we can also leave you a little love. 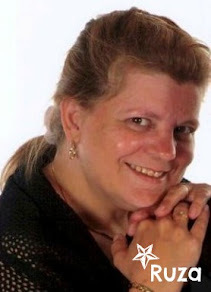 If you don't have a Blog or Splitcoaststampers Gallery, please email Ruza at greatimpressionsstamps@gmail.com with the Subject line "GI Monthly Challenge Entry", and she will enter it for you. this months Prize that is being offered. You may link up a Maximum of 1-project per month. 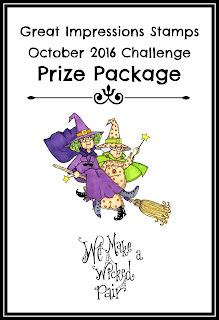 To view all of our Challenge Rules just click on the "Challenge Rules & Badges" tab above. 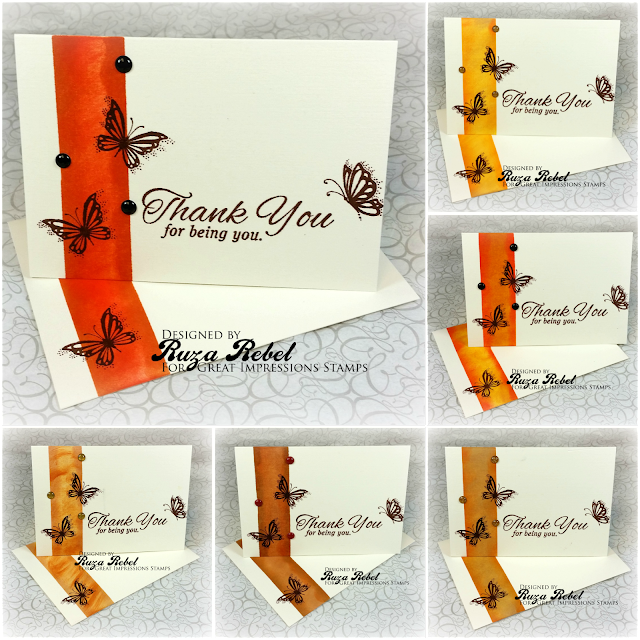 Don't forget to link all of your Great Impressions Stamps projects in the Customer Gallery! We look forward to seeing all of your beautiful creations!